More than 2.2 million passengers have sailed from Jacksonville during 15 years of cruise service at JAXPORT. 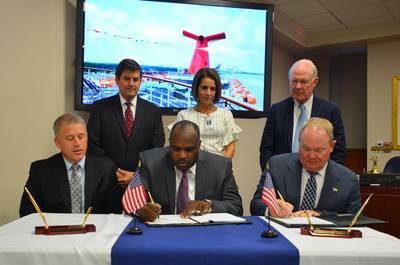 Now the port has reached a deal with Carnival Cruise Line to help that number grow even larger. An agreement signed today extends Carnival cruise service from Jacksonville through at least May 2021 and potentially through 2027. Carnival Elation will continue offering year-round sailing to the Bahamas from JAXPORT’s North Jacksonville Cruise Terminal. The contract extends the cruise line’s service from Jacksonville for three years with three additional two-year renewal options. The agreement also calls for enhancements to the terminal building and passenger experience. Beginning May 2019, the recently upgraded 2,056-passenger Carnival Ecstasy will assume Carnival Elation’s year-round four- and five-day cruise program. Carnival offers year-round departures from Jacksonville, carrying approximately 170,000 passengers a year.